Abridged text of an article featured in BBC Homes & Antiques, August 2003. Delicately ribbon trailed or ribbed, threaded with undulating waves, decorated with teardrops or gentle dollops of contrasting colour, the wares made by Whitefriars drew on every conceivable glass tradition. In emerald green, sapphire blue, straw opal and topaz, the glass was particularly famous for its radiant hues. But whatever style it echoed, it was always exceptionally well made. In 1834, James Powell, a London wine merchant, purchased a small glassworks in the Whitefriars district of London. The firm went on to manufacture domestic tableware, Mercury optical and scientific glass as well as some truly exceptional stained glass for windows. The latter was not only a very profitable line in a period of great church building, but also brought the Powell family into direct contact with pioneering architects such as George Gilbert Scott, Edward Burne-Jones and William De Morgan. The improvement of industrial design and the bringing together of the fine and applied arts were major concerns for the artistic community in Victorian Britain and in the second half of the 19th Century, Whitefriars found itself at the heart of the newly emerging Arts & Crafts movement. The factory produced glass tableware for William Morris, worked with CR Ashbee (founder of the Guild of Handicrafts) and participated in the exhibitions of the Arts & Crafts Society. 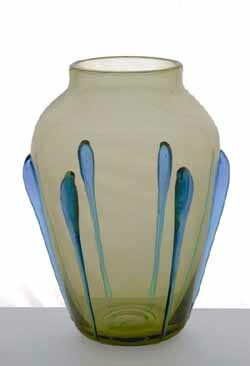 By the end of the century, as Art Nouveau spread its swirling tendrils across the decorative arts, Whitefriars glass as being sold by the most avant-guarde retailers of the day from Tiffany in London and New York, to Siegfried Bing in Paris, whose shop ‘Maison de l’Art Nouveau’ gave its name to the new decorative style. Whitefriars’ chief designed during this period was Harry James Powell (1853-1922), grandson of the founder James. While studying chemistry at Oxford, Harry had attended lecture on Art and design by John Ruskin, the most influential critic of his day. ‘All cut glass is barbarous’ declared Ruskin. He identified the main characteristics of glass as ‘its ductility when heated and its transparency when cold’, declaring that any glass which concealed these qualities was simply bad. Harry’s designs exploited the natural ductility and transparency of glass, and much besides. Drawing on his scientific training, in 1877 he developed two new delicate heat reactive colours, straw opal and blue opal, creating glass with a beautiful iridescence, which was used to create Venetian inspired vases and goblets. As well as looking back to Italian glass, in 1894 Harry studied glass from the Roman period onwards, looking both at Antique objects themselves and glass tableware depicted in historical paintings. His own designs absorbed antique elements from these researches, translated into entirely modern creations. Glasses were decorated with prunts (raised blobs) taken from 17th Century German romer (wide bowl glasses) and with trailed decoration that, while inspired by Roman prototypes, also captured the flowing naturalism of Art Nouveau style. His artistry and technique were superlative without being oppressive or fussy. Collecting these most desirable of pieces is not beyond an ordinary person’s pocket- if you’ve a mind to give up a holiday or two- but they are not easy to find, so it is worth seeking out specialist dealers and fairs. Very few pieces are marked, so you will have to rely on a dealers knowledge of the styles, and identification from catalogues and colour plated books such as the ones listed below. With high prices being realised for early Whitefriars glass, the later works are becoming more desirable, though whether they are a good investment is open to debate and a matter of taste. It is worth keeping an eye, therefore, on what happened to the factory after the retirement of Harry Powell. Harry ran the factory until 1919, and in 1922 Whitefriars relocated to a new site in Wealdstone Middlesex. As a design critic, Lesley Jackson has noted, during the interwar years vessel forms were simplified and decorative techniques were standardised. Harry Powell’s shapes were still used to create threaded vases in luminous blues, reds and yellows. Barnaby Powell (1891-39), Head Designer in the 1930’s, made vessels decorated with thick ribbon trails of molten glass and reinterpreted Harry’s tear glass designs. The factory also experimented with streaky and cloudy glass in richly glowing colours. After the Second World War, and until 1980 when the works closed, the firm continued to produce innovative work, particularly during the 1960’s when designer Geoffrey Baxter introduced his textured bark vases, in brilliant psychedelic colours ranging from tangerine to kingfisher blue. Although in recent years these pieces have attracted interest, for enthusiasts of early Whitefriars they simply can’t compete as the later pieces are mould blown and don’t have the same individual quality.